When the Monumental Brass Quintet of Washington, DC, arrived at St. Michaels and Cambridge-South Dorchester High Schools’ auditoriums to play for a combined 600 elementary school students, excitement filled the room. Children were having a hard time not swaying in their seats as the familiar Ragtime and classical pieces were played. 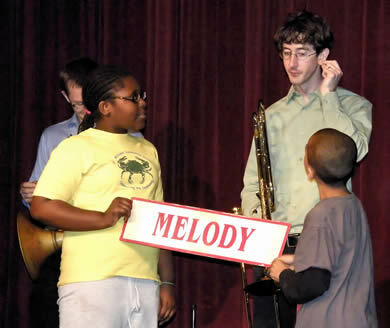 Chesapeake Music’s YouthReach sponsors these programs in an effort to reach as large a number of schoolchildren as possible.